This webcast will briefly discuss 'What is ‘social media’ and the changing online landscape. It will cover why and how your organisation should become involved and how to pitch a social media strategy to senior people. The session will show you how to discover which social media platforms are important and how you can become a participant in the online communities. You'll also learn how to map conversations about your organisation and discover how to use key social media tools including podcasts, RSS feeds, photos & video. 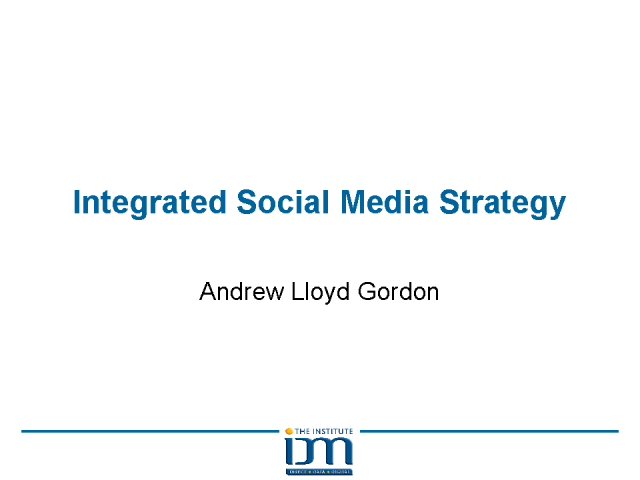 Andrew Lloyd Gordon is an experienced digital marketing trainer and consultant. With 12 years Web Marketing experience, he has worked on numerous online projects both large and small. With a broad exposure to both the public and private sectors, he has a special interest in Online PR. Andrew has successfully used the Web to boost the online PR rating of the organisations he works with. This leads, in turn, to dramatic increases in brand awareness and visitor traffic. As Director of UK250.co.uk and jobs.ac.uk, he exploited online PR techniques to increase media coverage including tools such as blogs, RSS feeds, video, DIGG Wikipedia and other Web 2.0 sites. Andrew is a much respected tutor with the IDM.